The District Health Planning Training Manual is a guide to using data to make programmatic decisions. This document assists users of OASIS by providing step-by-step processes and templates. Used for planning, identifying target populations, and interpreting standard mortality ratios. Rates of various Georgia health outcomes and behaviors with time series comparison to the U.S. and Healthy People 2000, 2010 & 2020 Objectives. Very Low Birthweight and Delivery at Level III Hospitals. Identifying perinatal risk factors for infant maltreatment: an ecological approach. Yueqin Zhou, Elaine J Hallisey and Gordon R Freymann. International Journal of Health Geographics, 2006, 5:53. 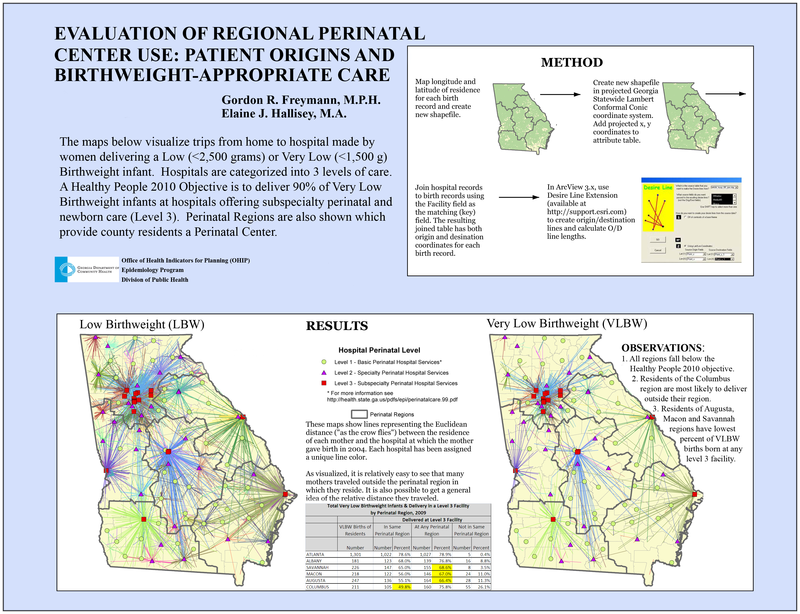 Demographic Clusters and Substantiated Infant Abuse and Neglect in Atlanta, 2000-2002. Stroke Mortality is Related to Hospital Readiness in a Stroke Belt State. Gold Standard Data Quality Protocol, 2nd. Ed. Procedures to assess and improve quality of data collected by the Georgia Department of Public Health. A list of terms related to the measurement of time, mortality, geographic, perinatal, and demographic variables. The Department Policy for and Specifications of Select Core Data Items. Define your project and system requirements: A guide for program managers and directors. This is a synopsis of Applying Use Cases: A Practical Guide written by Geri Schneider and Jason P. Winters (1998) and published by Addison-Wesley. The guide includes sections on defining boundaries of an information system and the functionality required of the system. Activity Diagrams are used to model information system functions. Fundamental Goals that serve knowledge management in the Department of Public Health. Principles applied to the Department’s data for use in a data warehouse. A list of elements to include and presentation methods to consider when preparing mapped health information. People ask us "how'd you build a data warehouse?" or "Do we have a data warehouse?" We do. The docs below are materials from Wiki and sqlservercentral in which we've made comments reflecting our approach.